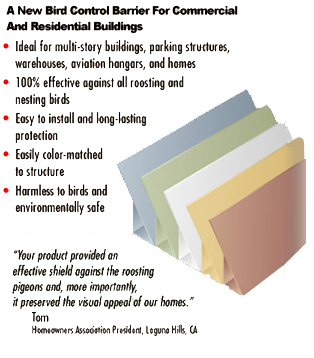 At BirdSlide® works for commercial pest control of pigeons or other birds on or in billboards, industrial areas, and other commercial or industrial related bird problems. Commercial prevention of birds is a four step process, the steps are outlined below. If you require further information we have made the contact us section available for you. The first thing we do is find and identify the pests invading your place of work, we search from top to bottom leaving no area untouched. Nothing is overlooked. There is nowhere to hide once we are on the job. Following the inspection you are presented with an estimate. If needed, you'll receive a comprehensive, written report listing all detected problems and the recommended treatment. We will explain the report thoroughly and answer any questions you may have regarding the report. We are confident in our abilities to serve you in a fast, efficient, and professional manner. After your place of work has been prepared, we will go to work immediately, not only will we remove the existing pests, but our methods help to prevent re-infestation as well. Once the job is complete we explain how to help guard against re-infestation. Our website is also available 24 hours a day as a handy reference guide to help you maintain a healthy vermin free environment. If you have, or have had a pest problem in the past, we recommend that you bookmark this site and return often to take advantage of the helpful tips located throughout the site.